While ‘polarisation’ in our responses to the challenges of today’s globalising world seems to shatter long established societal structures and relationships on all levels, more and more people are accepting that these challenges are also offering unprecedented opportunities to bring changes: changes that must start here, in me, my family, my community. Everywhere, and within every culture, people are becoming more outspoken and also more ready to listen to other’s point of view. There is less willingness to ‘patch up’ or ‘ignore’ issues; more readiness to participate in re-constructing and re-building new relationships from the bottom up. This is a very visible characteristic within the Wanganui community as well as New Zealand as a whole. Increasing honesty, good will and optimism are emerging from even the darkest and most troubled places. Fear, mistrust, and ill will, both feeding and feeding upon the chaotic state of affairs of the world, compounded by fierce defensiveness and lust for power on both personal and national levels. It is a very real challenge to learn how to move beyond this approach to life and living; how not to give it energy or be discouraged, but instead persist in the resolve to help build a new culture. Taking to heart the Declaration and Programme of Action on a Culture of Peace, adopted by the UN General Assembly October 1999, Peace through Unity considered how it could best respond to the call for people everywhere and within all walks of life actively to participate in the creation of a culture of peace. The realization of a new culture and a new civilization will indeed depend on the resolve and commitment of each one of us – the world’s peoples. Like large ocean vessels need little tug boats safely and accurately to harbour them before the distribution of their cargo can take place, so too does the realization of a global vision depend on the conscious and deliberate involvement of us all for its anchoring and implementation. In late 1999 early 2000 OPTU embarked upon a culture of peace project, which we envisioned would evolve, step-by-step, through interaction and cooperation between people, first within the local and then within the wider community. Taking inspiration from those visionaries who had already established the concept of a culture of peace in the minds of people throughout the world, we felt the importance of linking with and building on the foundation of their work and adding to the already existing momentum. With the help of the regional Art Gallery (the Sarjeant Gallery) and the approval of the Wanganui District Council, who also decided to donate a site for it on public ground, a culture of peace sculpture competition was organized for all artists of the region, and the winner’s name was announced at a multi-cultural celebration in the Gallery. A souvenir programme was prepared by young art students, which included the Manifesto 2000 and the symbol of Nicholas Roerich’s banner of peace (copies available). The design “Handspan”, chosen by 3 independent judges, is a large work of art, almost 20 meters in diameter which rises in a double spiraled pathway to a height of about 3 meters with walls on each side, covered presently with some 4000 terracotta hand casts made from hand prints of community members of all ages (each named), leaving room for more in the future. 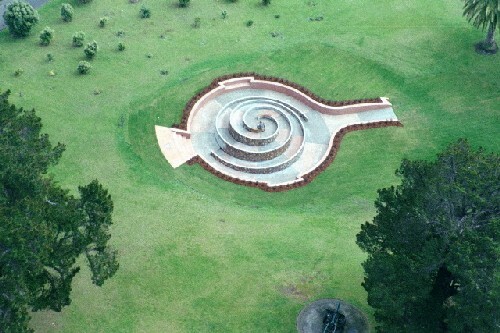 The construction of this unique structure drew together people from all parts of the Wanganui community, requiring the combined skills, ingenuity, generosity, and cooperation of engineers, architects, electricians, plumbers, plasterers and construction workers and also all those who contributed a hand (from 3 months to 106 years old) for its completion. Intensive fundraising by OPTU, including an auction of artwork donated by local artists, and other gifts, provided funding for this project. Through cooperation and through overcoming all challenges and obstacles during the building process, the sculpture stood ready – on the first fixed International Day of Peace, 21st September 2002, - to be dedicated to a Culture of Peace and Non-violence for the Children of the World by the New Zealand Governor-General who also gave a hand print) in the presence of people from the local and wider community. The sculpture was then officially – via the Wanganui Mayor - handed over to the community who, through their involvement, gave it life, substance and meaning. Standing on public ground on a historic hill in the heart of the city of Wanganui, neighbouring the Art Gallery, the Regional Museum and Library, and also the city’s war memorial, it has become a much visited and popular additional attraction for both tourists and people from the community. At the east entrance a plaque is inscribed with a quote from the UN Charter: “..to live together in peace with one another as good neighbours”, to be read as a definition of a culture of peace and underscoring the commitment made here to this UN goal. At the sculpture’s zenith another circular plaque carries the symbol of the banner of peace. Two adjustable and removable aluminium poles are available for those who wish to fly this or any other banner on special occasions. Since the 2002 dedication of the peace sculpture on the first Peace Day we have each year celebrated 21st September. In 2004 a well-attended multi-cultural Prayer Breakfast was organized at the Quaker Settlement, where people from different faiths and ethnic groups came together to chant, invoke and pray for a culture of peace. The UNA branch members mentioned the names of each UN member state, praying that peace would prevail in each and every one of them. It was decided to make this a yearly event. By way of thanking all those involved in the project and also serving as a public record and a memento, a coffee table sized book was published which, through pictures and text, describes the process of building the sculpture, the thoughts behind it, and the work ahead. The photos feature some of the many people involved and the text includes poems by local writers, the blessing ceremonies led by the Maori kaumatua overseeing this initiative, and various other contributions such as from the Wanganui Mayor and Federico Mayor, President of the Foundation for a Culture of Peace, Madrid. (Copies available). During 2003 and 2004 OPTU continued its efforts to promote the realization of a culture of peace. Acknowledging the immense work already done by remarkable people in this regard since the beginning of the 20th century until today, and recognizing also the importance of letting their accomplishments guide, inspire and empower the work lying ahead of us all, OPTU had a banner made, on which the 6 points of the Manifesto 2000 encircle the universal symbol for trinity on the banner of peace, created by the great Russian thinker and artist, Nicholas Roerich, who also founded the “Roerich Pact” (signed in 1935 by Franklin D. Roosevelt and since then by many other governments). This banner makes visible and unites the commitments made by both governments and peoples for the creation of a culture of peace and holds up the six-point guidelines we have pledged to abide by. More than 75 million people have so far signed Manifesto 2000. This ancient symbol, chosen for the banner, belongs to no one but all humanity, and brings together the world’s peoples in a culture that respects and celebrates all cultures. It also speaks directly to the individual heart. Among the interpretations given to this sign of the triad are: past, present and future, enclosed in the ring of Eternity and religion, science and art, held together in the circle of Culture. The banner is being used as a focal point for various events, celebrations and meetings by different groups and organizations here in New Zealand as well as in other countries. This pamphlet (4000 copies printed so far) has been distributed widely. It offers OPTU’s understanding of the essential role of culture in our lives and relationships and gives a short background for the Banner of Peace/Manifesto 2000 initiative. It also presents a proposal which asks that individuals, as well as institutions concerned with education on all levels, all places of worship and of cultural significance, local government and government ministries etc, “promote actively, consistently, and in every way possible the creation of a culture of peace, built upon the foundation of right human relations and the basic oneness of all life.” It also asks that we all uphold the pledge – in accordance with Manifesto 2000 – to respect all life; reject violence; share with others; listen to understand; preserve the planet; and rediscover solidarity. Copies are available to anyone who wishes to use or distribute them. On the 7th October 2003 Peace through Unity wrote a letter to the New Zealand Prime Minister, the Rt. Hon Helen Clark, proposing that “in order to help transform the present proliferation of a culture of conflict into a culture of peace” a Ministry for Peace, or a Department for Peace within the Ministry of Foreign Affairs and Trade be established. We argued that “while Freedom of speech and expression and Freedom of worship have improved greatly since the second World War, Freedom from want and from fear are still plaguing our world. The build-up of armaments has not created a sense of security, and neither has globalisation been successful in eliminating poverty or creating sustainable use of the world’s natural resources”. --Become a focal point for active and constructive cooperation between government (and its various departments) and civil society for the creation of a fairer, healthier, more prosperous and more enlightened local/global community. Early the following December OPTU received a reply from the Deputy Prime Minister, the Hon. Dr. Michael Cullen, stating that “there is no plan to establish a Ministry for Peace at this time”, going on to outlining the many ways the NZ government is presently contributing “towards peace-building efforts”. This response does, we feel, allow for further dialogue in this matter. Several national NGOs, such as the UNANZ and others, have subsequently officially endorsed this initiative. OPTU acknowledges the wisdom of the NZ Government in throwing the ball back into the campaigners’ court. Much thought, consultation and public awareness of and support for this idea needs to accumulate and give strength, clarity and sense of inclusiveness to the form it will eventually take. We believe it is essential that such a ministry should not be the outcome of a ‘special issue’ campaign, but rather become a ‘meeting place’ between government and peoples from all parts of society as outlined in the Culture of Peace resolution (i.e. parents, students, teachers, unions, artists, business, medical profession, environmentalists, politicians, lawyers…..) within which the concerns of each of these special issues could be openly discussed and find solutions that would be beneficial to all parties: solutions which could then be worked upon and implemented by the appropriate ministry, institution, organization or group of people. We would like to suggest that any planning for the formation of such a ministry should include the proposals made at the First International Conference on a Culture of Peace in Madrid, which call for a “global plan of endogenous development”. Such a plan of development coming from the very core of humanity should, according to the Madrid Declaration, be based on four “new contracts”: social, natural and environmental, cultural, and ethical and moral. The 1995 Report of the Commission on Global Governance, “Our Global Neighbourhood” also underscores the need for a global ethic which would “help humanize the impersonal workings of bureaucracies and markets and constrain the competitive and self-serving instincts of individuals and groups”. This would ensure, says the Report, that international society will be “imbued by a civic spirit”. With the concept of globalisation still needing to be better understood; with today’s generally accepted realisation that we live in and form part of an interdependent and continuously evolving organic whole - maybe one can look forward to future social structures resembling more that of a living organism than of a complex piece of machinery. Peace through Unity is presently involved in the process of creating a new website, dedicated to strengthening the ongoing work throughout the world to transform a culture of violence and mistrust into a culture of peace. UN HQ in New York, are regularly offering and distributing information, attending meetings and giving addresses on a culture of peace. Through our quarterly newsletter “Many to Many” (available on website and as e-mail), published since 1982, information and updates on culture of peace activities and initiatives are also networked widely. Thanking you for this opportunity to contribute to the midterm report of civil society to the UN Secretary-General for the International Decade for a Culture of Peace and Non-Violence for the Children of the World, we wish to assure you of our resolve to continue to participate in the global movement towards the emergence of a better, fairer and more enlightened global community in which we can live together in peace with one another as good neighbours. The Secretary-General often emphasizes the indispensable role of civil society in fulfilling the commitments made by UN member states. But – although the Secretary-General does specify this generic term when speaking to certain actors within civil society – OPTU believes that more encouragement could be given to and be much welcomed by us, the peoples of the UN, who may not fall within any particular category of actors but nevertheless constitute the very soil in which the seeds of a new civilization must take root if the commitments made by governments are to be realised. Since Peace Through Unity was founded in Sweden in 1975 we have cooperated with numerous different groups, organizations, institutions and individuals on many different short-term and long-term projects. Fulfilling the commitments that we made at the beginning of the decade.